The Holocaust Memorial (aka Memorial to the Murdered Jews of Europe, or Denkmal für die ermordeten Juden Europas in German) is located centrally in Berlin not far from the Reichstag. Completed in 2004, it consists of 2711 concrete stelae arranged in a grid pattern on a sloping field of 19000 m². 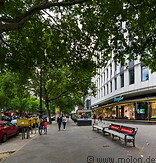 The Kurfürstendamm is a famous boulevard in Berlin. 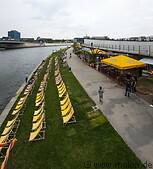 It extends from Rathenauplatz in the west for 3.5km until the Breitscheidplatz near Bahnhof Zoo and is full of high end shops, department stores, cafes and restaurants. The Marie-Elisabeth-Lüders-Haus is a government building not far from the Reichstag. Completed in 2003, the building contains a large audience hall for governmental working groups and the scientifc service centre of the parliament.